Discovered bees or wasps entering the confines of your premises, whether it's in your roof, a wall cavity, or a tree in the yard. The recommended course of action is to give them a wide berth and call one of our experts to assist in removing the bees or wasps. Bees inject a venom, causing pain, redness and swelling for up to 1-2hrs. 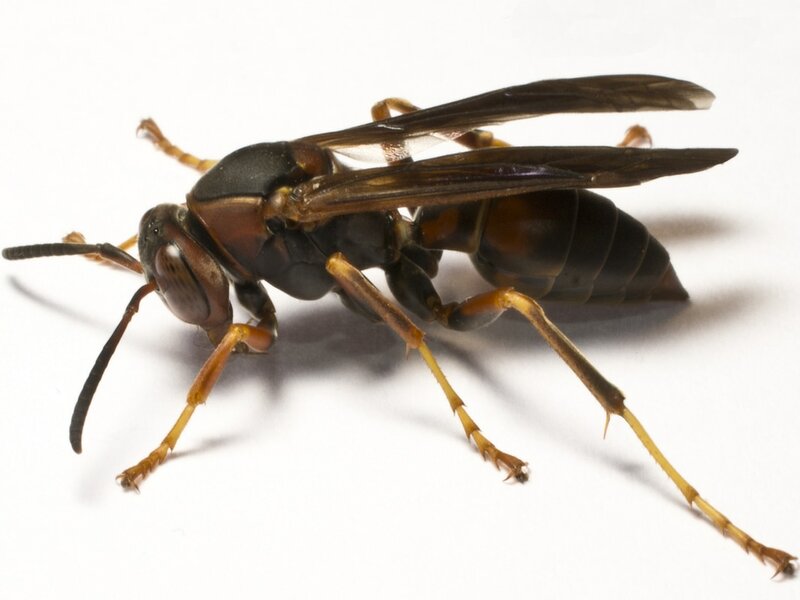 Wasps are more aggressive and repeatedly sting their victim. Getting stung by a bee or a wasp can be a painful experience, however for some people it can be a lot more serious and even be life-threatening. A dangerous proposition especially if you have children or are a child care provider. Just remember; don’t panic, ensure that occupants/staff are aware of the bees/wasps location and keep pets and children at a safe distance. Then call us and we will remove the bees/wasps in a safe and timely manner. ​Bees are important to the environment and SR Pest Control cares about the long term sustainability of our food chain and plant life that European honey bees and native bees provide. Not like the Asian honey bee which produces poor honey supplies and kills other bees. 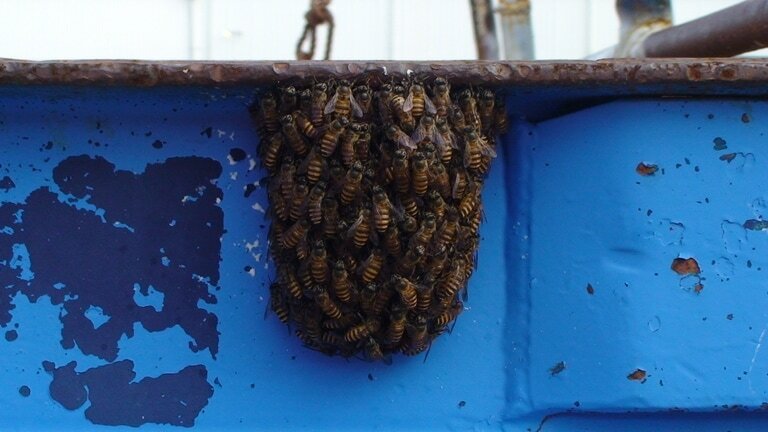 If you supsect you have European honey bees and are in a postion to allow relocation, contact a local beekeeper. However the majority of our bee calls in Cairns are Asian honey bees. Without getting too close, look at there flying. Asian honey bees fly in and out very quickly from the hive where as the European will hover around the entrance before landing and walk slowly into the hive. Give us a call and we will help you identify. Our serviceman can erdicate bees hives inside your property. In these confined spaces the honeycomb will be covered in insecticide. Once that has taken effect we will remove as much as possible of the honey comb, if not all of the comb to reduce the likely hood of another swarm beening attracted to the honey. Then the entry points will be closed off. For bee swarms outside, we will bag and dusted to elimante further stings. Wasps are more aggresive and specially formulated spray are used to elimate the treat. 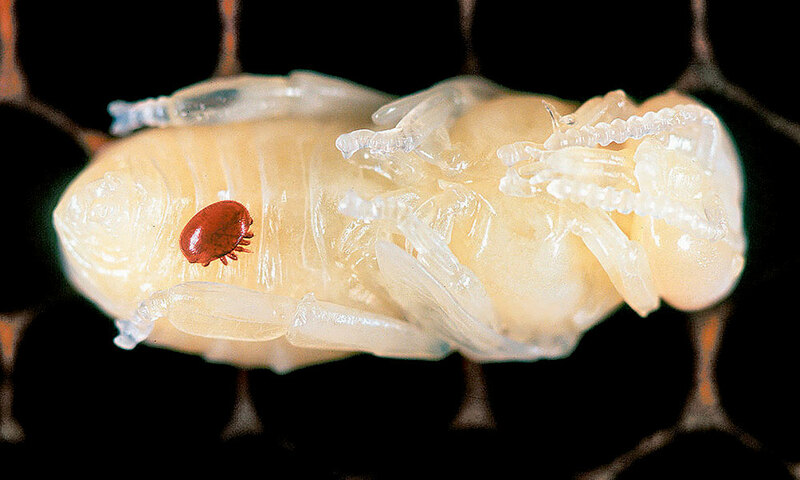 Varroa Mite transmitting its virus, which leads to death. Yellow with dark brown to black stripes, base of abdomen is blunt and round. Hairy with a golden appearance. Flight is slower and more composed. Asian Honey Bees are an introduced pest and are affecting European bee numbers. 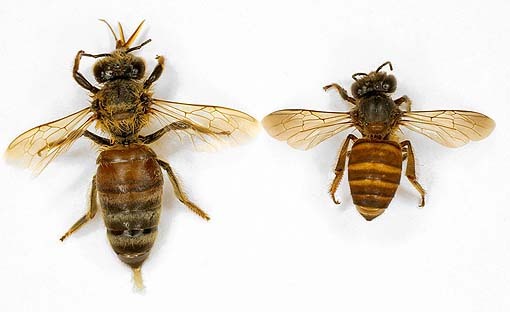 Asian honey bees can transfer parasitic Varroa Mites to European bees which leads to the death of their colonies. This can result in major economic losses for both beekeepers and growers of crops which rely on pollination. The Asian honey bee also has a negative impact on native fauna and flora.